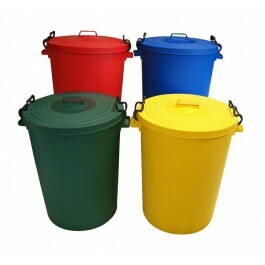 The 110Ltr Colour Coded Dustbin is ideal for use in any food environment. These dustbins are made from high-density food safe polyethylene, with robust plastic clips to the top of the dustbin ensuring the lid can be fastened fully, in place, to stop any waste escaping. The dustbins are also extremely popular within schools and businesses for seperating different types or recyclable waste. Available in all 4 food colours - Blue, Green, Red and Yellow. Height Approx. - 70cm Diameter Approx. - 53cm. Comes complete with lid and holding clips. Please note: item only available for pick-up or local delivery within 50 miles of our BB5 postcode.